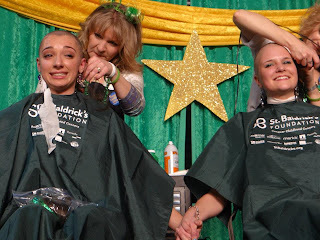 Home/Bald is beautiful, Brave women, Non-profits, Northern Nevada Children’s Cancer Foundation, So Reno, St. Baldricks, Volunteering/Bald is Beautiful! One of my favorite holidays is St Patrick’s Day. The reason why may surprise you though. I have had the honor over the last 5 years to participate in an amazing event called St. Baldricks. This organization raises money specifically for Childhood Cancer Research. Reno hosts one of the biggest events on record with the organization thanks to the tireless efforts of board members, volunteers and staff of Northern Nevada Children’s Cancer Foundation. Last night the event brought in over $200K! It is very humbling and inspiring to be surround by so many people young and old, male and female that “Brave the Shave” on that evening. Each “shavee” has a story to tell about a friend or a family member that has passed or is still in the fight with Cancer and why they are shaving. I love being able to be a part of it by shaving the heads of these warriors. Team Kylee’s Wish was the hardest for me last night. Kylee was diagnosed at 6 years old and lost her fight with cancer when she was 8. This year her big sister Kehli-Anne decided to shave her head in remembrance. My friend Chandra is shaving Kehli-Anne and I am shaving her best friend Ashley here. The girls were crying, shaking and excited all at once. It was so moving to be a part of such a personal journey, as these girls braved the shave. 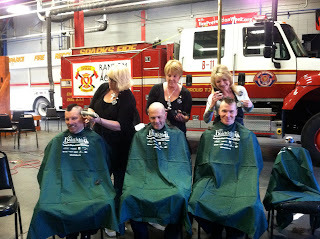 They are my new heros and proof that bald is beautiful! It is just remarkable to me how brave these women are. Both are attending their senior prom next week! I would never have been brave enough to do this in high school! Heck, I am not brave enough to do it now as a 48 year old woman! 36 children a day are diagnosed with some form of cancer. Because of increased research and treatment advances more than 80% of children with cancer now survive 5 years or more. Overall this is a huge increase since the mid 70’s when the 5-year survival rate was less than 60%. 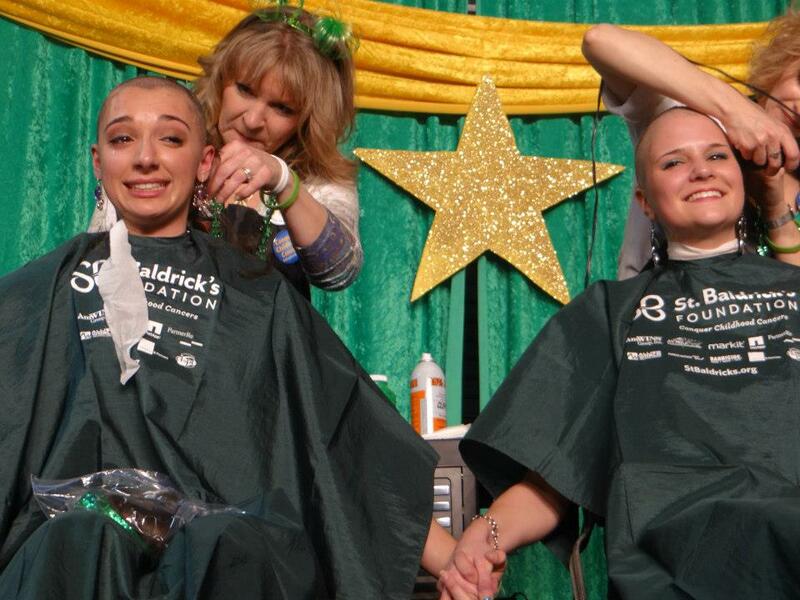 The St. Baldrick’s organization gives 82% of all the money raised to childhood cancer research. 16% goes to fundraising and an honorable 2% goes to management. That is a financial to be proud of! Anyone can organize an event and the events can be held anytime of year. In fact I have it from a good source, that they would like to spread the love throughout the year a little more. So if you are helping to organize an event or want to sponsor a fundraiser consider them! All you have to do is find a few crazy hairdressers that are clipper happy and set up shop! Before a fun run maybe, along with a sheep shearing contest, hmmmm what else could we pair this event with. Do you have an idea for a fundraiser or an organization that you are passionate about that you would like to share with us? Please leave a link in the comments below so we can check it out an learn about amazing things happening in your area. Thanks for stopping by my blog! See you next week! By Michon Kessler| 2013-03-17T22:06:00+00:00	March 17th, 2013|Bald is beautiful, Brave women, Non-profits, Northern Nevada Children’s Cancer Foundation, So Reno, St. Baldricks, Volunteering|Comments Off on Bald is Beautiful!